Blu Ripples Career Counselling Services is an organic one-on-one process that establishes and works with the individual needs and circumstances of the client; that is, we recognise the peaks and troughs clients experience as they move through their career lifecycle and tailor our career counselling services to meet their specific requirements. Working closely with you, over one or more Career Counselling sessions, we will listen, openly discuss your career challenges or concerns and utilise our specialist Career Education and Development, Counselling and Human Resource qualifications, experiences and research skills to inspire and empower you to make positive transformational career changes in accordance with your individual circumstances, career objective and time-frame. 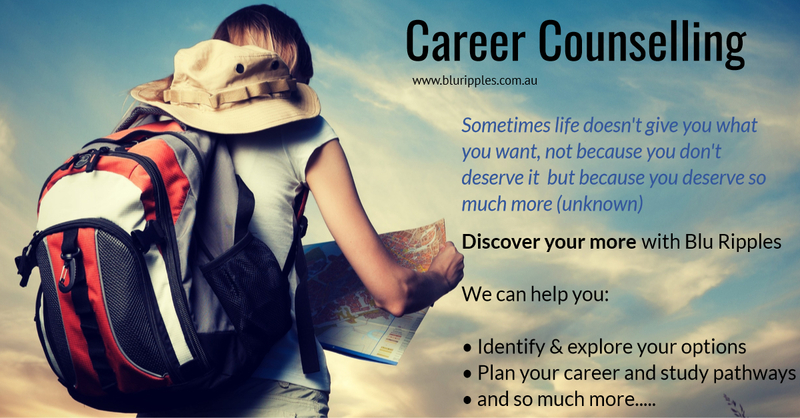 HOW CAN BLU RIPPLES CAREER COUNSELLING SERVICES HELP ME? Blu Ripples Career Counselling Services can help you or a loved one throughout the course of your career lifecycle; from the initial tentative stages of career planning and exploration as a high school student, graduate or young professional, to mid-life career transition and planning retirement exit strategies. Our Founder and nationally registered Career Development Specialist and Counsellor, Katherine Foster; who has authentically and systematically assisted clients in in private practice since 2003.
to empower and support you through the peaks and troughs of your career. Blu Ripples has provided professional Career Counselling Services to high school students, youth, graduates, mums and dads, adults, professionals returning to work after a period of leave, expatriates, trades professionals, transitioning Defence personnel and their partners, ex-Defence personnel, Defence contractors, supervisors, team leaders and management. In accordance with Australian legislation, Katherine possess two key national clearances – a Working with Children Clearance valid until 2020 and a Criminal History Check.